We know that true Christians are to suffer the fate of Christ … to be mocked and spurned by the world. But in modern America, we’re seldom burned at the stake or fed to lions. So I’ve often thought that Christian persecution looks very different in 21st century America than in almost any other place or time. But reading First Corinthians this morning made me wonder if we’re really in such a different position than those in the early church. 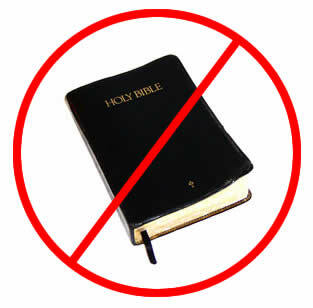 I was recently snubbed by a friend who told me that he “couldn’t stand all of (my) religious crap.” And I was really torn about how to feel. On the one hand, it’s to be expected: When we try to represent Christ and live the way he intended us to, we will be snubbed and mocked (if not worse). But that view may be too simplistic. Paul’s message to the Corinthian church is a reminder that, especially in a society where Christianity is upheld (at least on the surface), we’re just as likely to be perceived as pharasaical “moral police,” who are spouting their wisdom just like the Corinthians. Am I truly living like Christ did? Or like Paul? Am I humbling myself and serving others? Loving and praying for my enemies? I don’t mind being mocked or cast aside for Christ. And I expect to be rejected by “the world” – by modern secular culture. But I need to be sure it’s because I’m really acting like Christ – and not like a Corinthian. 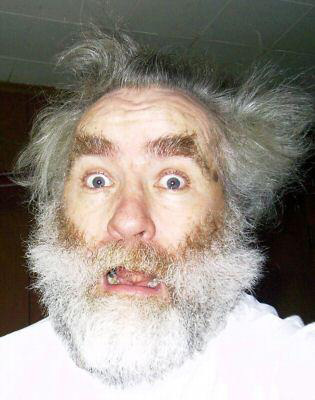 Scared to Death of Evangelism? 1-2You’ll remember, friends, that when I first came to you to let you in on God’s master stroke, I didn’t try to impress you with polished speeches and the latest philosophy. I deliberately kept it plain and simple: first Jesus and who he is; then Jesus and what he did—Jesus crucified. It’s important to study the bible and the doctrine of the church. And it’s important to pray for wisdom and discernment, and for God to give you the right words at the right time. But at the end of the day, nothing that you or I can do or say, no matter how well-studied, eloquent or persuasive, is going to change anyone’s heart – only God can do that. I may still be scared to death of evangelism … but so was Paul, and he did pretty well. May that thought give me the confidence to proclaim what I believe! Last year at this time, I was attending my second South by Southwest (SxSW) interactive festival – and the first I’d done on my own. I’d had such an amazing time at the first that I knew I needed to stay for the weekend this time in order to maximize my experience. I also knew that I didn’t want to miss an opportunity to worship that weekend. So even though I didn’t know much about any local churches, I did a google search, and wound up finding a church that was just a block from my hotel – and decided to go. I also, rather at the last minute, invited anyone else from the conference to join me. Not surprisingly, nobody took me up on my offer (Sunday morning is not a particularly popular time to be up-and-about at SxSW, as it turns out!). I had a great time anyway (the thing that left the biggest mark on me was the fact that the church was so strongly oriented to community service), and it planted a seed with me … I wanted to find a way to share Jesus with all of the people at SxSW who’ve shared so much with me. I eventually moved to Austin (about 2.5 months later, as it turns out), so this year’s SxSW was totally different. In the weeks leading up to the conference, most of my friends and broader social network connected on Plancast to share our plans for the conference, and to figure out where we were going to meet up. 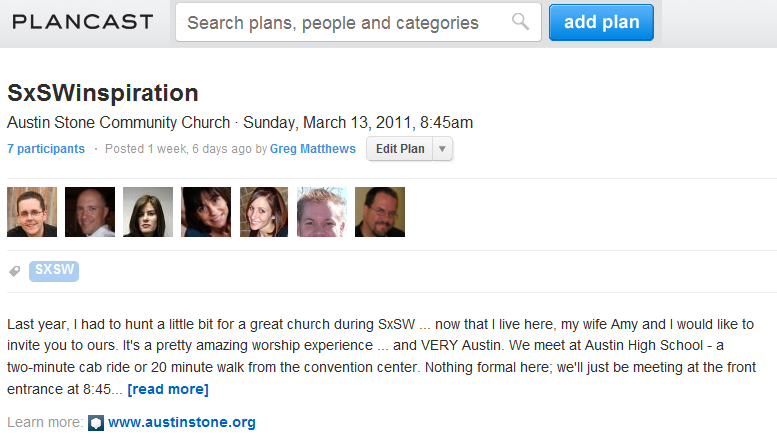 I figured that would be the perfect mechanism for us to put together an outing to my (now home) church, the Austin Stone. So I made up a name (SxSWinspiration – a play on SxSWinteractive), created the Plancast invitation you see above, and invited everyone along to the Stone. I had no idea what would happen … whether 50 people would join me, or zero … one seemed as likely as the other. The actual result was wonderful … my wife Amy and I wound up playing host to Bryan Person, Mike Neumann, Michelle Batten and Jay Ehret for an amazing message delivered by Pastor Jeff Mangum. It was wonderful to be together in worship for a short while in midst of all the craziness, and I feel connected to all of those folks in a new way. Only God knows where we’ll all be next year, but if he’s willing, this will be the first of many years of SxSWinspiration events … see you at the Stone next year!